The 1860's brought herds of Texas longhorn cattle up the Chisolm Trail to Fort Worth bound for the nearest railroad in Kansas. In the 1890's and for another 50 years the cowboys came to market their cattle, buy their hats, boots and saddles and to be entertained. Fort Worth and the Stockyards National Historic District is today a living history center where original building host retail stores, restaurants, and longhorn cattle drives. 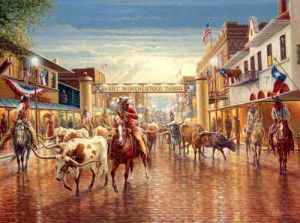 The Fort Worth Stockyards offers a fun-filled adventurous step into the history of the Old West available nowhere else but "Cowtown."